Check it out: "Hope for our World" only took me 36 years to complete. Whoohoo! I am feeling fine now, I tell ya! And who would have thought that I'd open a door to painting through Hope's birth. And and and and: now a first novel's come out of me! ... as you may see in my dances below. I still can't believe I did that. Have a good laugh with me! Let me know how you're revving up your life! Ah! All four books in my fiction series are out! You'll see in the link at the top of this page and on amazon: "through the lane to St. Anne ... One" and "...Two" "...Three" "...Four" 'What a feeling!' I look forward to you sharing your starry responses on amazon and Facebook. And thanks for passing on your pleasure in knowing the characters in this series with you family and friends. I'll love to hear any bits about your enjoyment. My 10th selfie dance video ~ "Walking on Sunshine"
with my appreciation for Katrina & The Waves! Anybody up for a feel-good dance with me? Jump on in! Bet you can't keep your feet still. Making our own sunshine, oh yeah! with a wink at the editing ... I wanted to do something about the leg hair ;-) (as in Cut all Backlit Pics!) ... but right then in my futzing (when I was putting this together two weeks ago) I happened onto Stephen Colbert in an Anna Kendrick interview, regarding HIS hair "This IS actually what I look like," [caps mine] he said, which prompted me into 'gonna enJOY' ... as will the man I eventually get to play with 'in my waning years.' Haha! Oh I do love creating the worlds we want. Hugs, you (all)! Here's my 9th selfie dance video ~ "Open the Door"
Indulge me, if you can, by checking into where I’m coming from with this (and for somehow translating into your own use): I’ve only recently discovered that challenging myself to new skills ~ the on-the-ground ‘dancing,’ the ‘filming,’ the editing into a final product, even the ‘asking’ followed by the heart-fluttering anticipation of my weather change wants to be fulfilled/waitin’ not only for a good-sized storm but every-day-excited for me rainbow to come ~ these all combine into an internally-produced cocktail (norepinephrine, epinephrine, and dopamine, along with the blisser oxytocin), which for me is the best natural high that helps in healing any wayward body parts and in maintaining my emotional uplift. And why this song, this time? I was looking to step inside the feeling of opening the door in me, of stepping out into yet more of what I’ve got cooking in me mind. You know, revving my intention. So when I searched for ‘open the door’ songs and hit on Judy Collins’s high notes (this audio from her live performance at the Metropolitan Museum of Art when she was 72, though she’s singing strong now at 78), I had to locate a match to her uplift within me (from my 71). Then, as I was workin’ it, what a surprise to find the song’s turnaround (again in my mind), which has more to do with looking at installation of, and then upon consideration, questioning a welcoming side door to my sweet reclusion. (Maybe more to come on that later. Just wanting to note the red flag that comes up for me if I begin to believe research and/or well-meaning input about what makes a long and healthy and intimately-connected life. Each of us finds that in our own ways.) Yay that this selfie-videoing has given me the opportunity to expand my clarity about welcome to inner and outer combined. Wowsers! I had to go with Judith’s song! Thank you, Judy. I have one after-hope for anyone stopping by here: maybe this “Open the Door” selfie video will in some way connect with your self-understanding and/or lift you as it has me in the making (and Judy originally, over the years and again in NY - do check out her full performance), and possibly provide you a brief respite from the heavy news cycles. My 8th selfie dance video ~ "I Wanna Be Like Me"
My point in making another video and with this particular song ~ I am glad! I am glad that I haven’t let ’70’ get me, stop me, convince me of anything other than that I am just as eager now as I was at three years old to hop on the fence (mere lack of a horse) and ride! Or before long it was reading as I rode ;-) . My point is only to trigger myself to keep being like that ‘here we go!’ girl, whatever my changes in speed and preferences in play become. In this brief ‘down time’ as I wait for my hard copy proof so I can greenlight my next book release (YES - WhooHoo), while welcoming a little break from my citizen work too, I noticed how I’ve been holding off on Selfies because ... well surely you can imagine some of the ‘becauses’ that might knock me off my rocker. Such as wanting to protect myself from others misreading me. I like, I get back on. Yes, the best thing of all about '70' may be in finding out I don't care a hoot whether anybody Likes my various ways or not. I am so glad I lived this long. You know what, I love writing, in seriousness. I love ‘filming’ as play. And let’s face it: I love the wobbly knees bein’ in love with life that comes with both! (And when playing with kiddos.) ‘I wanna be ... like me’ (myself, though this particular tune has me laughing at the ridiculous speed ... oh was I sore, good muscle sore, after all the takes ;-) ). This is not my only speed, but it’s definitely a natural for me, and for many kids. Ever since I first saw “The Jungle Book” I wanted to dance Balloooo. Thank you for permission, Maverick, to share my enjoyment of your music and Life (via inclusion of ads on youtube sharing). ﻿GIDDY ... here after all, I’ve done it again, another selfie dance video. This Jason Mraz/Colbie Caillat song moved me so, I had to do something. Their words weren’t spot on for me, yet the tune, the harmonics stirred straight to my soul ... right on into adapting the 2009 lyrics so everything lined up with how the song made me feel. (Yeah, I don’t believe in ‘luck’ anymore; I have a couple different concepts in my beliefs where luck and lucky used to be. Sorting that out was pleasurable. Doing this number also helped me shore up the opposite of waiting, waiting around for fulfillment from ‘out there.’ Ever since I realized I can be and am simply giddy with Sophia (Sophia’s the name I use for the source of all things and ideas/the at-oneness in us all and in all things/the greater-than-me Source), I'm more giddy than not. You'll find my lyrics in the first Comment on my Facebook post, if you have Fb. My rendition’s not ‘about Sophia,’ it’s about feeling. ... Okay, I invite you to play in this groovy anthem with me. I’m “Giddy” ... whadda you got? I can’t believe, but it has been ... I recorded the audio eight times some weeks back. Nearly ran out my data usage for the month replaying the original video. I knew I could get to singing better. I determined I’d come back to it. But then I let it sit. I also got stuck on/pictured myself filming from my new home, after I get to move back to the hill where I want to be. But because of that wanting, I totally let this flow in me slow to a near stop. Then to fill the void, other things popped up ... body restoration stuff, yada blah blaahh. The best medicine FOr mE is to let myself be totally ridiculous. And anyway, am I going to wait to dance giddy while my moments slip by? Or am I going to again, as I did to my first “Happy” dance, just let myself ... let out my love. My expressions being Incomplete. No circumstance keeping me from my giddy. Yup yup yup. It’s always a ‘which direction will I lean today?’ Into waiting till ... Or will I ... I like to tickle myself into giddy. I also want to add, a quote that struck me during this interim* ... another’s experience from which I tap into my own courage. I haven’t taken up a sport (yet) at age 68, but I will risk this (my second time) singing publicly. Singing was long ago a sweet part of my life. Just like muscles, especially of the lungs, a voice unused atrophies. So I’m building up mine, decades later ... ah ah ah, Ooohh ooooh oooh oooh ooh it’s never too late ... with appreciation for the many inspiring senior athletes. I must have sung this through 100 times to expand/retool/retune before I tried the first recording. My point about repeating is, not to note how many X’s, but a practice I made to not only get so I could hit the note sometimes, but also so I could and did give myself that many rounds of feeling good ... in those moments ... not waiting till ... and till ... Simply because I can, because my happy measure is all up to me, right now.) I’ve always had a camp voice; love camp singin’! This is my ‘good enough/let it go’ eighth take. With more off camera singing to come. I just watched “Giddy” again, offline (here at hand via a click on my desktop for that hitching vibrational britches, you know), and I REALIZED besides my contending with the wind, my dog hopping over the seats, the camera operators passing torches (wooden easel to cardboard box to front seat, due to the gusts) ... ‘dance floor’ diminishing as I needed to inch the car over grass patches so my camera wouldn’t clunk onto the pavement ... besides those minor infarctions (heehee), I HAD NO MUSIC PLAYING. Somehow it wasn’t occurring to me that previously I’d plugged in to a house (wink) ... I was friggin’ ‘dancin’’ to the song in my head! (which accounts for the skimpy dance clips assembled when I came to my editing room wink emoticon. Ergo, patting on my back for going ahead and sharing my giddy video anyway. I mention because, good for any of us at this time in life especially if/when we pry loose another of the ‘gotta be perfect’ clamps. This may seem sillily noted as ... well, duh ... clearly there’s never been anything approaching perfectionism in my having fun with these videos. (I KNOW THAT ~ heehee ) Still, there is a letting go, the ‘who gives a rip!’ that is worth noting. Tra laaaa! Ha haaaa! I’d love to hear your letting go stories!!! *And here’s where I found my courage to put this selfie song and dance online: in random selection from the library’s new shelf, a punk rocker’s memoir. (I love listenin’ to what makes others tick, and Viv Albertine holds nothing back.) On page 79 Viv raves up the influence she invited from Patti Smith, “I rush home and put the record on. ... The structure of the song is unique to her, not copies of old ... they’re a mix of improvisation, landscapes, grooves, verses and choruses. She’s a private person who dares to let go in front of everyone, puts herself out there and risks falling flat on her face. Up until now girls [me ... older wom] have been so controlled and restrained. Patti Smith is abandoned. Her record [though I’m not drawn to Patti’s or Viv’s, theirs inspire me] translates into sound, parts of myself that I could not access, could not verbalize, could not visualize, until this moment.” Here’s to the slip of a reveal within each of us in whatever ways we choose to release. My 4th selfie dance video to “Living in the Moment” by Jason Mraz. Lee Isaacson Roll commented on my last dance video, which I had hoped she wouldn’t see, out of concern for our, in those moments, different abilities. Instead, she popped right into the conversation. Lee’s words << Keep dancing, laughing, exuberant living! Do the things I can no longer do (well, I still laugh-- a lot!) and have the best time ever! You brought back so many memories of JR and the kids when they were little rocking out to Flashdance. Keep on! >> ... So this, Lee, is <3 me with you <3 . Feels like stirring up joy together; thanks for being with me still. My preface here is no way apology, more my self soothing: I am aware that my energy is a little low after the weekend’s 11-hour drives, road trip and glory days with my daughter and son-in-law in the Sierras, the 11-hour drive home on Monday somewhat diminishing. I was thinking of a dance coming round though, feeling a bit of a poser too :-) as my last is already months back. I don’t make these selfie videos in any planned way though. I wait until I’m hit with an idea. So that wondering when another dance is coming increased after I read of Lee’s passing, belatedly late Monday night. And then ... this morning when I woke at 3:36, eager to get up, I knew: Today I will Dance with Lee. And I will do so with gentleness for us both, as I continue on, setting my own stage for ‘ease’ from here on. I’m also noticing, shiveringly so, how fun this is ~ when things line up they really line up. Early on the morning I was leaving for E's, I went out my seldom-used side door, to the garage for loading up. Right there on the narrow steps, a fox had left me a Happy Trails tribute. And then THIS morning when I was out catching the moon ... I’d been on the deck, come in for a minute ... I was about to step back out when there was the fox walking right past my hammock where I’d been two minutes before. ON THE DECK, my hand on the door, four feet from it! I did take a breath and go on out. Then I’d nearly finished filming that segment, all grin inside, when a bat almost bonked my in-the-air feet. Done enough, feeling more giggly than weirded out by the bat, I was taking my pup to our front door which has a substantial landing under a porch roof, wide set of steps ... and right there, sometime in the night the fox had left its little giftie. On our front porch. Now I don’t know about you, but I feel holy blessed when creatures make their close comings and goings super apparent to me. Come on over to add to the fun. ~ Happy on Me Mind ~ Okay, before I give myself a heart attack with Takes 9, 10, and 11 ... and with my due caveats ‘what IS that body that doesn’t look like I feel’ and ‘I know I can do better than this’ (especially if I’m not in front of a camera :-) ... 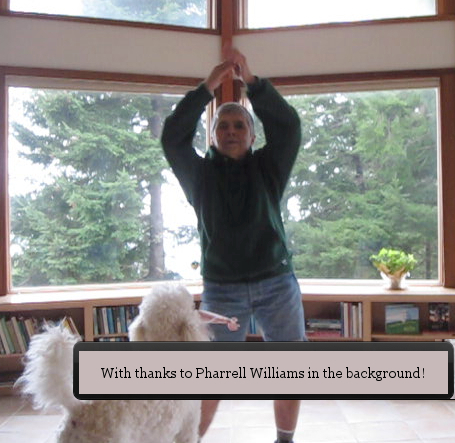 I am posting today because (amid Marchiness, weather-wise) it is a part of my ongoing practice to focus on/contribute to ~ thank you Pharrell Williams ~ The Happiness of Our World, even when it means a roll-out on the ridiculous just to make me (and you) laugh. With love and big hugs especially for those feeling any current situation not to your liking, the seriousness of many events notwithstanding, I join with you in intent and knowing that we always always have a choice (with so many models, past 'n present) ... to make happy! May the impulse sweep you too right onto your feet, or wheels, or what-have-you. Let me know where you’re dancing! Or send a clip!! With my great appreciation: In “Flashdance” the movie, the original was sung by Irene Cara who was the lyricist with Keith Forsey, the music by Giorgio Moroder. One requirement I place on myself in making and posting videos is that from inspiration to recording/posting I move quickly, embracing solely my immediate geography, ‘wardrobe,’ spontaneous ‘choreography,’ novice techie skills, etc. in order that I don’t get caught up in perfection obsessions. (What you won’t see then, in my in-the-moment outbursting of video is my dancing in my heart with my kids and their spouses and kids, the lot of whom I adore with this same passion.) So my huge thanks to Sister Cristina Scuccia and her winning “Voice” performance in Italy, singing which transcended seeming limitations, and inspired me a few days ago. Brava! Rather than perpetuating the belief that my old thought line is uncrossably, tenaciously tripping-up grabby, I am comfortable with noting the line now between my believing in myself (or more basically, simply loving myself) and letting myself soar has become, through my practice, so thin it's immaterial. As in posting ... video 3! Yay! Even though I do still have to hurdle over or dodge around: Do I dare; I don’t want what I do to bring up hurt in anyone, knowing I do sometimes make takes that come out insensitively other-than-intended; I should have blah blah; My feet hurt and other this & that body stuff; Maybe it’s too late; and the lousiest of all, What will others think? ... I continue now yay yay yay to let myself open to the exuberant flow that is me. (And who, I ask myself, who has let themselves be all they could be, ever threw up a permanent barricade that said ‘selfie’ is too self-y? The point of a selfie isn’t me, it’s letting go, relief, liking, owning, rising into mySelf and all the other feelings leading up to JOY. And joy is so WAY bigger than me. Here’s to loving ourselves enough/and loving others enough, to skip on by those snatcherly thoughts.) If not now and without apology, when? Yay for the feeling I get in laying down a sentence that I like ... oh, I don’t mean these fingers-flying types in my posts and emails, I mean the deep writing work I get to do. As soon as I’m done dancin’ today, I’m on to what’s current, my first full novel, well underway! Whoohoo! “Farewell to Ashley Longworth,” my fifth and maybe last selfie video (with Bloopers!) ... or maybe just the last for a while. (It IS FUN!) No damage done in this one ... just thinking ... might be time for lessons as I’ve maxed out variety in the dance, or at least what comes out of my hands and feet on the spur of these moments. Regarding Ashley Longworth* ... maybe you secret one yourself, or maybe you hold onto an idea that has lovely aspects but really truly you’ve moved on, or you would if you said good-bye on that front. I’m more goofy than usual after my all-nighter ... so I won’t suggest making ‘sense’ in this ... just enjoy ... if you like. Hugs and off we go. And later: I've been thinking about Kitty L. Coleman's comment on my Fb post, 'as long as you're having fun with [the video dances]' ... Thanks! I like running through the various aspects in my mind. You know one thing I absolutely LOVE? The putting together the clips, fitting them to the music, remembering as best I can the 'do this' FIRST, 'and don't forget that part before you do the other.' It's a challenge ... one I LIKE. And it's like nothing I've ever done before. One way I really know the 'this is for me!' satisfaction: last night I looked up from the the computer, the physical doing long done, and I realized 'that's dawn coming on!' ... And the last time I'd glanced at the clock was four or five hours before. I love engagement and 'getting up to speed' with something, and having little bits of it turn out enjoyably. Think of what filmmakers must experience in getting to watch a full movie they've put together! And: This whole dancing and posting my dancing isn't at all about 'Look at me!' or even 'look at me.' It's about loving the energy that pours through me ... I mean, just LOVING IT ... how it feels to lose track of time and stay up all friggin' night just cuz I'm having so much fun.) And the real kicker/the heavyweight 'oh, it's not just me ... wow, there are others on this island??!!' is when I get to hear from you/others about times when you likewise are just bowled over with being alive (or trying something new, or doing something you've wondered if you could). This is the fun that goes on, after the event itself. And that brings up another point I'm wanted to say ... this time I have is a huge gift, something I've taken/ made for myself (you have to know, my life hasn't always been like this, where I actually can stay up all night and not have little ones needing me in the morning, though I wouldn't have missed those days for anything); I hope everyone who would like similar time with ease in their lives gets it/creates it at some point in their lives, to explore whatever would come up for them, not in performing necessarily, just in living. Hugs! And thanks for coming round! * Regarding Ashley Longworth: It's seems I may be a rare one here who not only gathered her family on the couch every week during their growing up ~ I did make popcorn, provided candy, I'll give me that ~ taking that one-hour “Waltons” reprieve, enjoying watching someone else meet the challenges of parenting, and who remembers as if a part of our extended (TV) family, Miss Emily Baldwin's pining away for a brief love, expecting him to return at any moment. Well well to my farewell (not that it matters; it doesn't). Happy now.